These tasty savoury squares are made with spinach, eggs, cheese and flour. They taste wonderful when served warm, but you can also leave them to cool and pop them into your lunchbox for a filling snack. Serve with a little salsa. Rip the mozzarella into rough chunks and finely chop the onion. Grease a baking tin and preheat the oven to 200C. 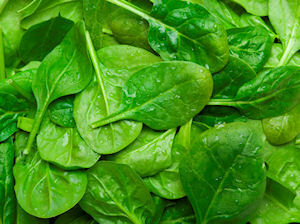 Wilt the spinach in a frying pan until limp. Remove from the frying pan and squeeze to remove the excess water before roughly chopping. Mix the flour, baking powder and salt and pepper together. Stir in the eggs, milk and melted butter. Mix until smooth. Stir in the spinach, mozzarella, cheddar, garlic and onion. Pour the mixture into the prepared tin and put into the oven for 30 minutes, or until a skewer inserted into the centre of the dish comes out clean. Some chopped ham would be a lovely addition to these spinach squares. You could also try adding some chopped, cooked mushrooms. Recipe makes 24 squares. These delicately spiced scones give off a delicious smell whilst they're cooking.